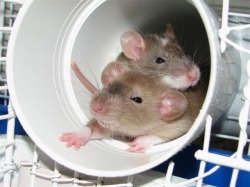 Many mistakes are made when it comes to the housing of rats. 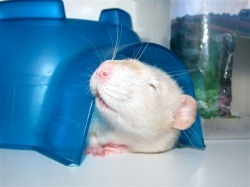 There are some misconceptions doing the rounds about what's ok for your rat and what's not. Here's a quick guideline that should help you back on the right track. Cedar and Pine shavings are the worst choice of bedding you can make. These shavings give off an acid that damages rats' already sensitive respiratory tracts. This acid actually destroys cells within the respiratory tract and trachea. Studies have also shown that rats kept on wood shavings have a particularly high liver enzyme count. Besides this, the dust factor in the wood shavings irritates the rat's respiratory system and aggravates it even further. Corncob - available at many pet stores. 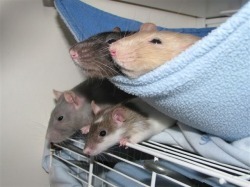 Rats also love snoozing in hammocks and snooze cubes, these can be found at a select few pet shops but there are plenty of South African suppliers to order from online, and they are also fairly easy to make. They also love the "cheap" toys, like cereal and tissue boxes.